I was just outside Waingaro Springs when the Powerade began to take hold. 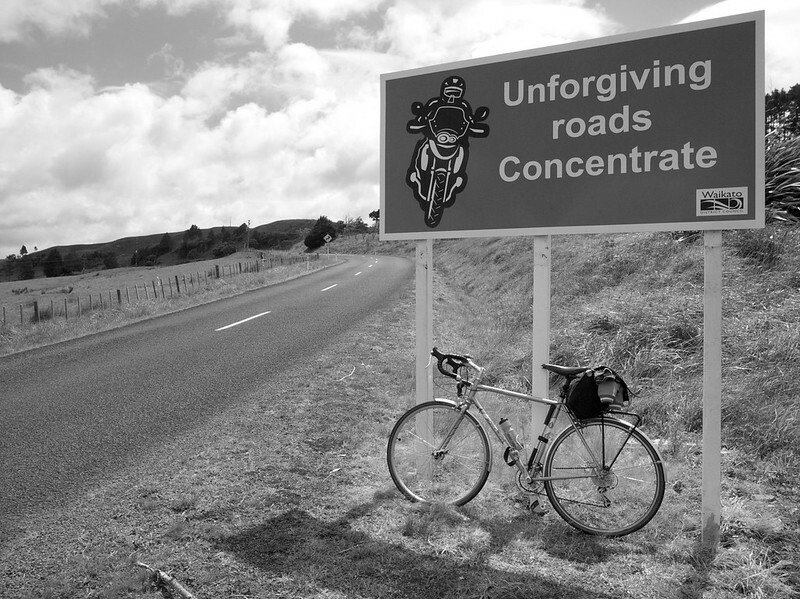 The sign reading “Raglan 29km” that yesterday had made me want to cry (because I was hungry, tired, pretty much sick of this whole thing and still had 29km to go) had the reverse affect today – it was 11:30 in the morning and I was already a third of the way home. I was full of sugar and electrolites (whatever they are) and feeling good. 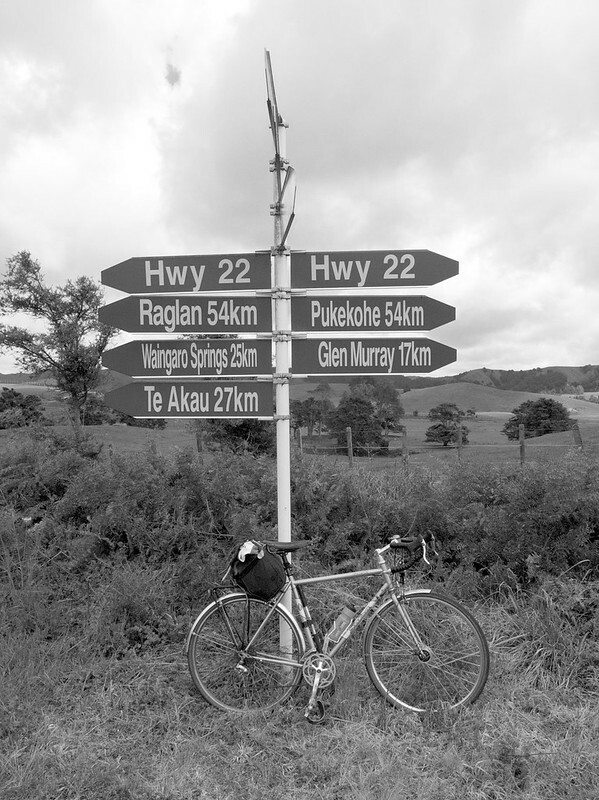 The previous day (Monday) I had caught the train from central Auckland to Pukekohe and then ridden 125km to Raglan. 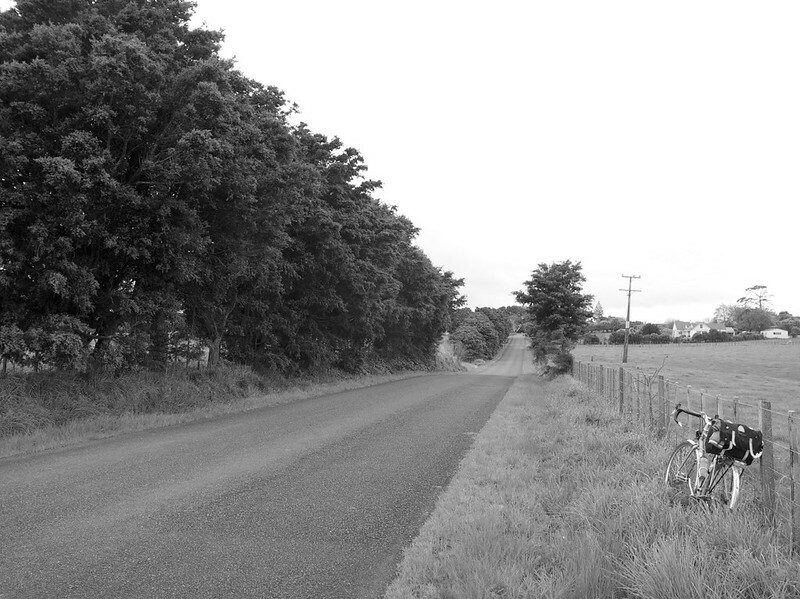 It wasn’t supposed to be 125km, it was supposed to be 105km, but I had taken the wrong road out of Tuakau. This took me on a 20km Detour of Futility which I regretted bitterly later. 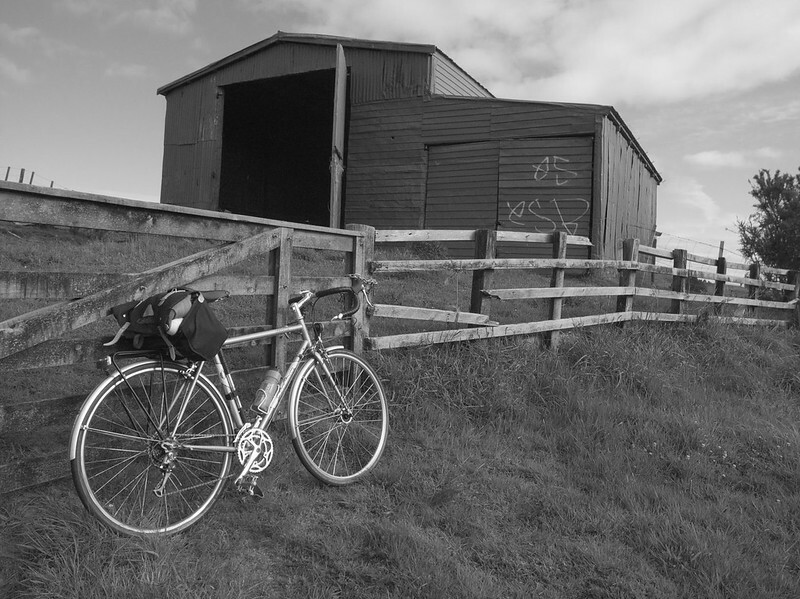 The trip was my first attempt at bicycle touring. I had, somewhat cautiously, chosen a route described in a book by The Kennett Brothers as “Auckland’s Great Escape”. 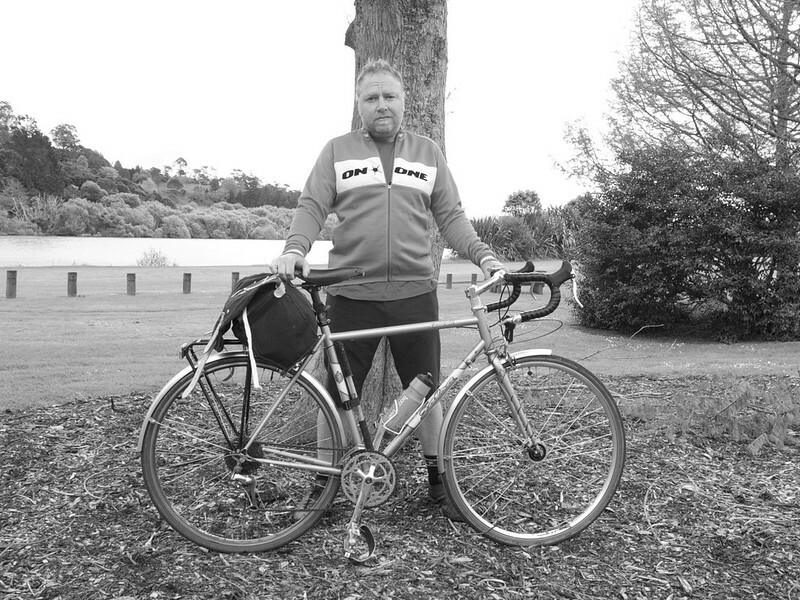 The plan was to ride down on Monday, stay the night in Raglan, ride back to Pukekohe the next day and then catch the train home. 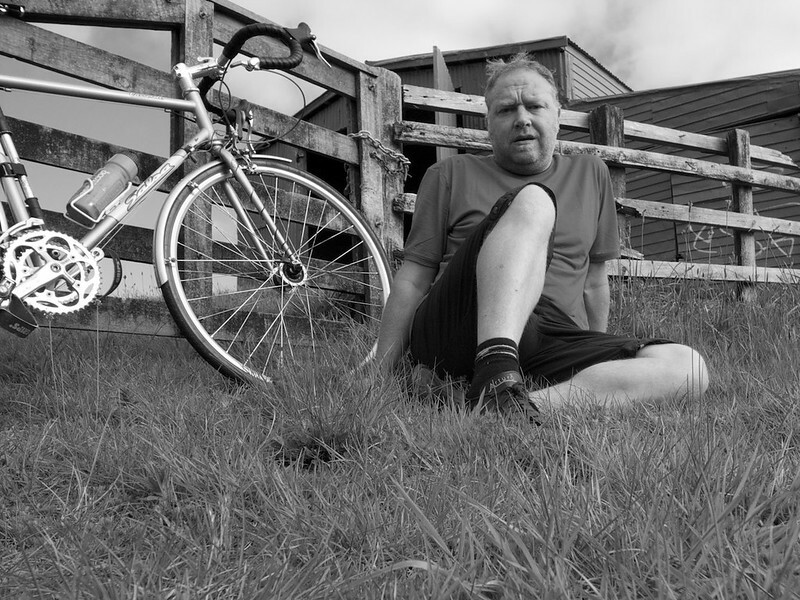 It didn’t sound that big of a deal – I ride an average of 100-150km a week around Auckland, and had done a couple of 100km loops & survived. How hard could it be? Quite hard as it turned out. My attorney had strongly advised me against the journey – “Why are you doing that? It’s too far! What’s wrong with you?” she had shouted when I mentioned the idea. Yesterday as I had gasped past the turnoff, wondering if I was going to make it, her sage words had haunted me. But today I couldn’t help thinking that perhaps I should just get a more supportive lawyer. Because today the sun was shining, the road was empty, and I was on the way home. The next section of the road was my favourite of the whole trip – a beautiful valley full of cows, sheep, horses and turkeys. A surprising number of turkeys really. Some of whom were very keen to impress their ladyfriends. The ladyfriends seemed fairly underwhelmed with their displays though and looked to be politely edging off to somewhere else. After the valley, the road headed upward and then meandered along a ridge for a while. One of those ridges where it’s always windy and the wind is always a headwind. I stopped for some time to watch a couple of harriers riding the wind above a gully. Now & then they would swoop down near the trees, and pairs of magpies would fly up and chase them off. Although I lack the beauty & deadly elegance of a bird of prey, I could sympathise with them – a magpie had chased me yesterday too. I had also helped (sort of) round up some escaped cattle, seen men cleaning beehives, and watched a pair of Paradise ducks chasing their errant offspring across a field. The road between Onewhero and Waingaro Springs is pretty good for watching wildlife thanks to the absence of traffic. At times I had the road to myself for 20min at a time. I talked to the guy at the garage & he told me that it’s busier at weekends, mostly with motorbikes. Which explains all the giant road safety signs along the way that have motorbikes on them. 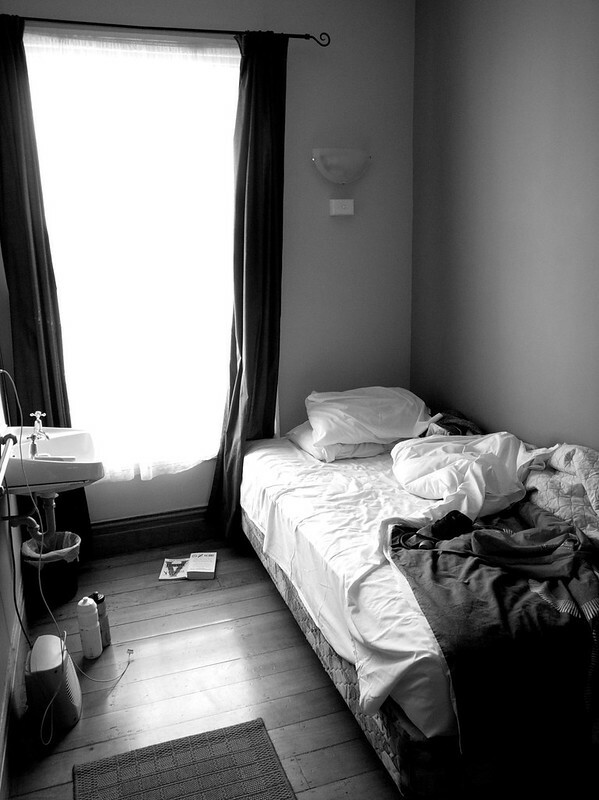 Days later, the memory that keeps coming back to me, is how it felt on the way back, when I had passed through Pukekawa and stopped at the top of the long hill leading down to the bridge over the Waikato. It’s a lovely view, and it’s when I was finally sure I was going to make it home. There was still 20km to go, but they were flatish kilometers, and going home always seems shorter doesn’t it?